NTT DOCOMO plans to increase its number of LTE base stations from 24,400 (March 31, 2013) to 50,000 by March 31, 2014. 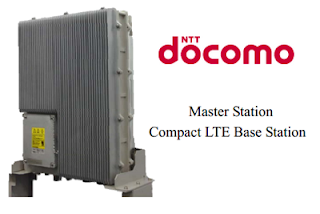 As part of this effort, NTT DOCOMO introduced a new compact LTE base station with simultaneous 3G capability, measuring less than 1/10th the size and less than 1/5th the weight of conventional LTE base stations. The first units entered commercial operation in DOCOMO's Xi LTE and FOMA 3G networks in Japan this month. The compact all-weather base station, which is mainly designed for area expansion in low-traffic areas such as mountainous locations, can be installed in places where conventional LTE base stations cannot be deployed due to excess size or cost. The new base station, equivalent to the master station of a remote-type base station, can handle up to two secondary stations. Furthermore, thanks to the new base station's 3G W-CDMA capability, simultaneous LTE and 3G service areas can be tailored efficiently to traffic and installation conditions by using secondary stations and multiple frequency bands. Electricity consumption is less than 1/4th that of conventional LTE base stations, realizing more eco-friendly operation. In February, NEC confirmed that NTT Docomo has selected it to develop LTE-Advanced base stations for its new C-RAN architecture. NTT Docomo is proposing a new Advanced C-RAN architecture that uses small "add-on" cells for localized coverage that act in concert with macro cells in HetNet fashion. Deep integration is achieved using carrier aggregation technology, one of the main LTE-Advanced technologies standardized by 3GPP. Under the Advanced C-RAN architecture, high-capacity base stations utilizing advanced C-RAN architecture will serve as master base stations both for multiple macro cells covering broad areas and for add-on cells in smaller, high-traffic areas. The base stations will accommodate up to 48 macro and add-on cells at launch and even more later. Carrier aggregation will be supported for cells served by the same base station, enabling the flexible deployment of add-on cells. In addition, maximum downlink throughput will be extendible to 3Gbps, as specified by 3GPP standards. Carrier aggregation is expected to yield 3 Gbps maximum throughput by aggregating multiple carriers of up to 100 MHz of carrier bandwidth. 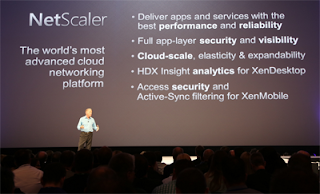 Cisco will integrate the Citrix NetScaler application delivery controller (ADC) technology into the Cisco Unified Fabric Cloud Network Services portfolio. Specifically, the Citrix NetScaler 1000V will be sold by Cisco and its channel partners worldwide and supported by the Cisco Technical Assistance Center. The announcement builds on a strategic alliance announced by the companies in October 2012. The Citrix NetScaler 1000V will integrate with the Cisco Nexus 1100 Cloud Services Platform and vPath service insertion architecture to uniquely link to the Nexus 1000V. As part of the Cisco and Citrix collaboration in next-generation data center and cloud architectures, the Citrix NetScaler SDX service delivery networking platform and the Citrix NetScaler MPX hardware-based line of ADCs will also attach to the Cisco Nexus 7000 Series switches in the future. This capability will provide customers the benefits of higher resiliency, plug and play installation, improved agility, and increased leverage of both their switching and ADC investments. A portfolio of virtual services for the Cisco Nexus 1000V virtual networking environment will be available, including the ASA 1000V Cloud Firewall, Virtual Security Gateway virtual firewall, virtual Wide Area Application Services WAN optimization solution, Cisco Prime virtual Network Analysis Module, and Cloud Services Router 1000V. The portfolio also includes best-of-breed third party virtual services offerings that are seamlessly integrated into the framework. Citrix NetScaler 1000V will seamlessly co-exist and interoperate with the broader Cisco Cloud Network Services family. The two companies are also collaborating on go-to-market initiatives, including the publication of Cisco Validated Design (CVD) reference documents to assist customers gaining full leverage from Cisco’s Unified Data Center strategy. “As enterprise IT aligns itself with cloud rollouts and virtualization, datacenters are becoming the cornerstones of business, driving the need for closer integration between functional elements, and optimizing how applications are delivered over IT and network infrastructure. In that context, the cloud network services-focused partnership between Citrix and Cisco is clearly a step in the right direction,” stated Ram Appalaraju, Vice President, Products, Data Center Group, Cisco. 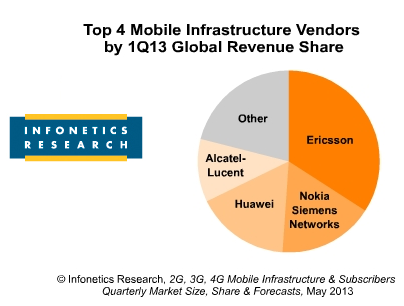 The worldwide 2G/3G/4G mobile infrastructure market totaled $9.8 billion in Q1 2013, down 9% sequentially, and down 2% year-over-year, according to a new report from Infonetics. Overall sales fell despite another LTE ramp-up driven by North America and Europe. "We are clearly seeing the broad shift to LTE and its direct effect on 2G, 3G, and WiMAX,” notes Stéphane Téral, principal analyst for mobile infrastructure and carrier economics at Infonetics Research. “Typically strong 2G and 3G markets, China in particular, did not come to the rescue this time around. In fact, China and Russia had a busy 1Q13 selecting LTE vendors." Global mobile subscribers are forecast by Infonetics to reach 7 billion by 2017, with LTE subscribers making up just 8% of total subscribers. Swisscom is set to become the first European operator to launch LTE roaming services on a global basis. The mobile operator is using Ericsson's Diameter Signaling Controller, which is implemented in an Ericsson Blade System platform. 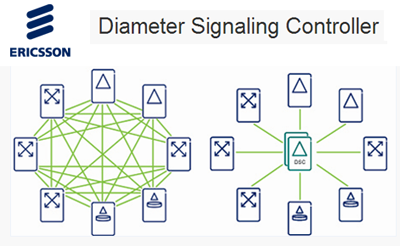 Ericsson said its DSC supports the scaling of Diameter-signaling networks, is mission-critical and requires carrier-grade software and hardware. Magnus Furustam, Vice President and Head of Product Area Core and IMS at Ericsson, says: "We have now passed a major milestone in our development project for the Diameter Signaling Controller. We are very proud that Swisscom selected Ericsson for the launch of its LTE roaming service. Our solution will alleviate some of the signaling load and make the signaling network even more reliable." Cisco agreed to acquire privately held Composite Software, a developer of data virtualization software and services, approximately $180 million in cash and retention-based incentives. Composite Software, which is based in San Mateo, California, connects many types of data from across the network and makes it appear as if it's in one place. Composite's software integrates traditional and new data sources including cloud and big data, into a simplified consolidated view. Cisco said Composite's software will expand its portfolio of Smart Services, enabling companies to better leverage network knowledge (APIs) and programmability, which maximizes the benefits of data virtualization. As with the transition from physical servers to server virtualization and from physical networks to network virtualization, together Cisco and Composite will accelerate the shift from physical data integration to data virtualization for customers and partners. "Cisco's strategy is to create a next generation IT model that provides highly differentiated solutions to help solve our customers' most challenging business problems," said Gary Moore, Cisco president and chief operating officer. "By combining our network expertise with the performance of Cisco's Unified Computing System and Composite's software, we will provide customers with instant access to data analysis for greater business intelligence." Composite Software was founded in 2002. Investors included Apax Partners, Clearstone Venture Partners, Dot Edu Ventures, Palomar Ventures and Tenaya Capital. BT appointed Gavin Patterson as chief executive, replacing Ian Livingston, who will take up a role in government as Minister of State for Trade and Investment. The change will occur in September. 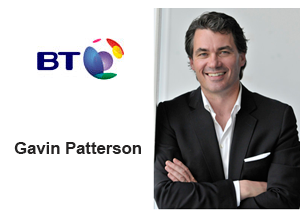 Gavin Patterson, 45, has served as chief executive of BT Retail and as a BT Board member since 2008, having joined the company as a senior executive four years prior to that. He previously spent four years at Telewest (which later merged with NTL to become Virgin Media), including as managing director of its consumer division. Before entering the communications sector, he spent nine years at Procter and Gamble, rising to become European marketing director. Sir Michael Rake, Chairman of BT, said: “Ian has done a tremendous job in transforming BT. His decision to accept a government post demonstrates the sense of public service which many of us know to be characteristic. He leaves behind him a very capable team, one which will take forward the strategy that has served BT well and which lays out the path to further success. NEC was selected to upgrade APCN2 (Asia Pacific Cable Network 2) to 100G wavelengths. The contract was signed by the purchasing consortium of 13 major telecom operators involved with APCN2. 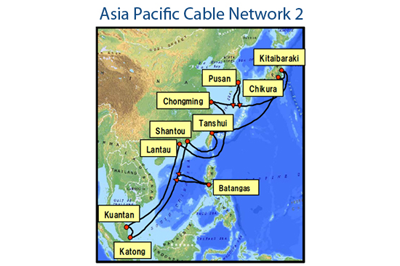 The APCN2 system, with over 19,000km of cable, connects 10 landing stations in the Asia Pacific region and was originally supplied by NEC in 2001 with a 10G DWDM system design. The system was later upgraded with NEC's 40G DWDM transmission equipment in 2011. "We are honored that the APCN2 purchasing consortium has again selected us as their capacity upgrade supplier. This upgrade is indeed a significant step for NEC as well as for the industry, as we demonstrate our ability to provide high-quality and state-of-the-art 100Gb/s DWDM products and services on a system designed for 10Gb/s DWDM in order to meet and surpass client demands," commented Dr. Yasuhiro Aoki, General Manager of NEC's Submarine Networks. The upgrade is scheduled to be completed by 1Q of 2014. The APCN2 Purchasing Consortium include AT&T, China Telecom, China Unicom, Chunghwa Telecom, Vodafone, KT, NTT Communications, MCII, PLDT, Reach, SingTel, Softbank Telecom, and StarHub. KPN International is implementing Huawei's second generation soft-decision forward error correction (SD FEC) technology in its pan-European 100G WDM backbone. SD FEC is an advanced error correction technology for optical transport field. Huawei said the use of Optical Digital Signal Processing (oDSP) modules, essentially a 400G technology breakthrough, achieves lower-penalty WDM transmission with lower power consumption per bit. Specifically, the second generation SD FEC system empowers a transmission distance of 4000 km, which is 1000 km longer compared to the first generation SD FEC system, resulting in a 30% higher transmission performance. In addition, KPN and Huawei announced a pan-European 400G field trial. The OTN-based 400G network spans 540 km between Amsterdam and Dusseldorf and vice versa. There is ample margin in the system, confirmed by adding 300km in the end terminal station. Huawei noted that it has built more than 90 commercial 100G networks for operators worldwide. KPN first deployed Huawei's optical transport platform in its European network in 2008. Russia's Mobile TeleSystems (MTS) selected Ericsson to deploy its LTE network in four regions covering more than half of Russia, thus becoming MTS's main vendor. Financial terms were not disclosed. Under the three-year agreement and starting in Q2, 2013, Ericsson will roll out LTE in the Siberian, Ural, Volga, and Southern Federal Districts of Russia. In the first stage of the project, Ericsson will supply no less than 10,000 new-generation products from the RBS 6000 series. We will also supply core network hardware and services in the same regions, as well as in the Northwestern Federal District. As part of the agreement, Ericsson and MTS will extend their cooperation to further develop 2G/3G networks in several regions in Russia. "The regions we have targeted for 4G service coverage are very important industrial hubs with key sectors driving the Russian economy: mining, engineering, processing and farming. There is a very high demand among consumers here - including corporate subscribers - for innovative services and mobile broadband. We intend to start building 4G networks in Russia in the near future to provide subscribers in approximately 15 regions in Russia with high-speed data services by the end of 2013," stated Andrei Dubovskov, President and CEO. 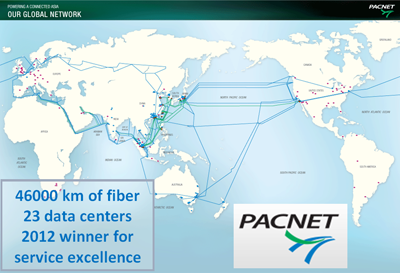 Pacnet, which operates submarine cable systems with over 46,000 km of fiber and connectivity to interconnected data centers across 16 cities in Asia-Pac, has signed Master Service Agreements (MSAs) with each of China Telecom, China Unicom, and China Mobile for BGP Internet connectivity services that will integrate into its Internet network fabric in China. The agreements with Pacnet’s equity joint venture in China, Pacnet Business Solutions (PBS), ensures that BGP Internet services offered will conform to internationally recognized performance standards, ensure scalable expansion opportunities for customers, and provide for service level agreements. PBS is the first Sino-foreign joint venture telecommunications service provider in China to have been awarded licenses by China’s Ministry of Industry and Information Technology (MIIT). These licenses allow PBS to provide IP VPN services across 23 provinces in China, Internet access services in 10 cities and data center network services in 5 cities. 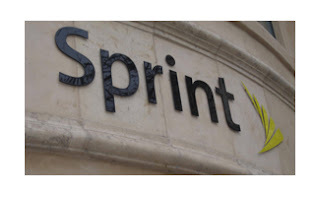 Sprint increased its bid to acquire the approximately 50 percent of Clearwire it does not currently own (the “minority stake”) by $5.00 per share, valuing Clearwire at approximately $14 billion, or about $0.30 per MHZ-pop. The new offer represents a 47 percent premium to Sprint’s previous offer of $3.40 per share announced on May 21, 2013 and a 285 percent premium to Clearwire's closing share price on Oct. 10, 2012, the day before the Sprint-SoftBank discussions were first confirmed in the marketplace and Clearwire was speculated to be a part of that transaction. This offer also represents a 14 percent premium to the $4.40 per share DISH tender offer. Sprint said the sweetened offer demonstrates its commitment to closing the Clearwire transaction and improving its competitive position in the U.S. wireless industry. Symmetricom announced a strategic restructuring plan and updated financial guidance for its fiscal fourth quarter ending June 30, 2013. The restructuring plan includes the realignment and consolidation of several organizations, elimination of certain activities, and a workforce reduction of approximately 12% of total headcount. Symmetricom expects to incur total charges in the range of $7.5 to $8.0 million in connection with the plan, of which approximately $6.8 million will be in cash. Upon completion, the company expects these actions to generate annual cost savings of approximately $13 million. "The steps we announced today are the result of a recent comprehensive business review and reflect the driving of efficiencies across our operations, while continuing to meet the needs of our customers." said Elizabeth Fetter, chief executive officer of Symmetricom. "The overall business environment remains challenging as we face a number of headwinds which we expect will continue into fiscal 2014. These actions better position our business and demonstrate our commitment to delivering solid profitability in the current operating environment while continuing to invest in our key growth initiatives." In April, Symmetricom named Elizabeth A. Fetter as its new CEO, replacing David G. Cote, who left to pursue other interests. The company also announced that Robert T. Clarkson has stepped down as chairman of the board of directors and that James Chiddix has been elected to succeed Mr. Clarkson as chairman. Fetter has previously served as President and CEO of several private technology start-up companies, including QRS Corporation. She served as President, Chief Executive Officer and a director of NorthPoint Communications, a network services company, from 1999 to 2001. Ms. Fetter previously was Vice President and General Manager of the Consumer Services Group at U.S. West and held various senior executive positions at Pacific Bell.